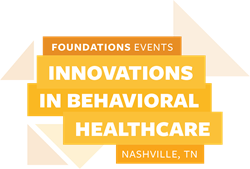 Foundations Recovery Network (FRN), an innovative behavioral health treatment provider, is proud to announce that the Innovations in Behavioral Healthcare Conference (IIBH) will be returning to Nashville for the fourth year in a row. The conference will be held August 9-10 at the brand new JW Marriott downtown. The two keynote presentations kicking off and wrapping up the event will feature nationally and locally recognized community leaders on addiction and mental health. The 2016 CNN Hero and a White House “Champion of Change,” Becca Stevens, founder and president of Thistle Farms, will draw from her personal experience as leading a community of survivors to become the largest social justice enterprise in the US. The event’s final speaker is Miles Adcox, owner and CEO of Onsite, an internationally known emotional wellness lifestyle brand. He will present on emotional fitness, guiding attendees through living a centered life, while teaching them to thrive in today’s 100-mile per hour, high-stress environment.